mer All-American wide receiver Albert Wilson (Wednesday), defensive tackle Christo Bilukidi (Wednesday) and tight end Emmanuel Ogbuehi (Friday). John was drafted in the seventh round of the 2014 NFL Draft by the Indianapolis Colts. Wilson signed an undrafted free agent contract with the Kansas City Chiefs this past May. Bilukidi was drafted in the sixth round by the Oakland Raiders in 2012 where he played for a season and a half before signing with Cincinnati in 2013. Bilukidi was also the first Georgia State football player to be drafted in the NFL. Ogbuehi signed free-agent contracts with the Washington Redskins and Miami Dolphins in 2013 before signing with the Cleveland Browns this past June. Georgia State athletics announced that the Panthers will play at Penn State in football in 2017. 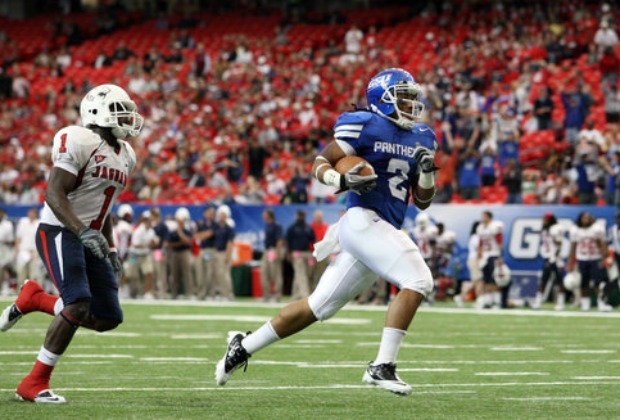 The Panthers will receive $1.2 million for the game, the same amount they get for playing at Wisconsin in 2016 which ties the largest pay-to-play amount for Georgia State. Senior guard Ryann Green was named to the 2013-14 NABC Honors Court on Monday. The NABC Honors Court recognizes men’s col- legiate basketball student-athletes who per- form well in academics during the past season. The former walk-on guard averaged 4.8 points per game this past season. Five men’s soccer players will compete in the United States Youth Soccer (USYS) National Championships. Sophomore forward Amiri Abraham and redshirt freshman forward Tyler Alexander will play for the Concorde Fire Elite team in the under-19 division. Freshman Rashid Alarape, freshman goalkeeper Greyson Walldorff and redshirt freshman midfielder Everick Little will play for the GSA 96 Premier team in the under-18 division.